Why not use Kielder Water & Forest Park as a base to explore the rest of Northumberland or even as part of a longer trip to the north of England? There are many places to visit including stretches of beautiful coastline, bustling cities and the great outdoors. Imagine a magical kingdom with ancient castles, golden beaches, rolling hills, great parks, and wild moorland. Such a kingdom exists – it’s Northumberland and it truly is a magical and inspiring place. The magic is here because Northumberland is so many things to different people. It has friendly market towns and a rich arts scene. History comes alive in Northumberland, as does the great outdoors! We offer fantastic walking, fishing, golf, sailing and riding. Come for a day trip, stay in a cosy cottage or B&B, or enjoy a world-class hotel. While you're here, feast on many of our local foods - everything from lamb, fresh vegetables, and oysters through to honey, jams and luxury ice cream. Northumberland is a county filled with contrast. It is England’s last great wilderness and it really does offer something for everyone. NewcastleGateshead offers a huge diversity of urban culture; from eclectic shopping opportunities, chilled café culture, contemporary restaurants, cutting-edge theatre and vibrant nightlife, to the iconic quayside or one of the many free museums and galleries. Durham City - take a river boat cruise, catch a show at The Gala Theatre, or visit delightful cafes, galleries, markets, wonderful hotels and character filled shops. 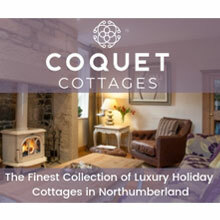 Here you’ll discover authentic experiences and genuine hospitality unique to County Durham. Trek across the picturesque moors and valleys of Teesdale and Weardale, or visit majestic castles, living museums, and bustling market towns. Imposing castles, elegant abbeys, stately mansions and dramatic ruins make the Scottish Borders perfect for culture vultures. Add to this the finest music, art and fresh local food in idyllic surroundings. Where trees and hills abound, mountain bikers and cyclists won’t be far away. The Scottish Borders is the regular haunt of all kinds of bikers on trailquest rides, cross country trails or high octane downhilling. Wild peaks reflect in tranquil lakes. Windswept crags contrast with rolling hills. Dense forest opens onto bracken cloaked slopes. Try a lakeside amble or a full-scale trek on England’s highest mountain. Visit market towns, country houses, art galleries and heritage sites. Join in with local festivals or hide away at premium spas - a land of rugged beauty and exquisite indulgence. Yorkshire is home to spectacular scenery, world class attractions, a year round calendar of festivals and events, vibrant cities alive with culture and fantastic restaurants and shops. Take a trip to the coast and enjoy miles of clean golden beaches, immerse yourself in history within the region's historic houses and gardens, enjoy a designer shopping experience and take a piece of Yorkshire home. With its distinctive open and tranquil landscapes and unique heritage, Northumberland National Park will provide you with wonderful memories to savour. Stretching from Hadrian's Wall in the south, through the rolling valleys of the Tyne and Rede to the impressive hills of the Cheviots on the Scottish Border, the National Park has some of the most unspoilt landscapes in the country. Roman forts, museums, stunning scenery and live action events. English Heritage is guardian of over 20 fascinating places to visit on Hadrian's Wall. Housesteads, Birdoswald, Chesters and Corbridge are perfect places to visit during your trip to Kielder Water & Forest Park. Whether you're on holiday or enjoying a day out, this World Heritage Site is the best known frontier of the Roman Empire.